Bring Your Own Technology (BYOT) refers to learners being able to bring any mobile computing device in to school and connect it to the school network, without having to register the device in advance. In practice this usually involves connecting the device to the internet via the school wifi connection. 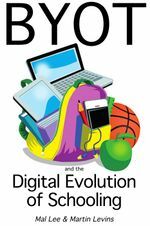 Like BYOD, BYOT enthusiasts argue that educators should find uses for the technology that young people already use and not impose a technology imposed by the school Walsh (2012a). Mobile technology is already widespread. Some 77% of (US) teenagers (12-17 years old) have mobile phones, and around 25% have a smartphone. Some 75% o all teens text, 63% say they text every day Waxman (2012). Mal Lee, a key BYOT advocate argues that global trends in technology use mean that BYOT is inevitable. These include the normalised use of personal digital devices among learners, the growing educative capacity of students' homes, Cloud computing, and governments' inability to fund 1 to 1 computing. In many ways, BYOT is a market-based solution. Lee insists that the market is a better judge of appropriate personal digital technology than any group of ICT experts Lee (2012). For Lee, the fundamentals of BYOT are that technology is chosen by the student and/or their family; there is personalisation of teaching and learning in and out of school; in-school technology use is an extension of students' existing technology use, and there is respect for student ownership of technology and information stored on it. He notes that some schemes call themselves BYOT, but seek to impose technology on the students Lee (2012). In BYOT schemes, students liked the versatility that mobile phones and text-messaging provide, enabling them to access course materials and communicate with peers and teachers while riding on the bus, waiting to be picked up, or during other ‘down’ time. Interactivity in (and out of) the classroom can “promote an active learning environment, facilitate the building of a learning community, provide feedback and increase student motivation” Walsh (2012a). Many of the concerns expressed about BYOT are similar to those expressed about BYOD. The need to support a diverse range of devices, and difficulty in controlling viruses make technical support difficult. Teachers fear that students' access to non-instructional material will distract from learning, and they will be unable to monitor students on their own devices. They also fear being "shown up" by more tech-savvy students, or that video of them may be posted on the internet. Lack of administrative control also interferes with schools' legal requirements to ensure students' e-safety Zuniga (2012). Again, issues around equity also arise. There are worries that students bringing a range of devices may amplify the gap between haves and have-nots. These schemes may also over-ride the wishes of those parents who wish to supervise or restrict their children's internet access. There is also the question of whether a school or district can afford the required number of loan machines to back up BYOT Zuniga (2012). Other critics take an anti-market stance. They argue that BYOT pushes costs to families that should be met by government and that it may exacerbate the digital divide. "What next," says one, "bring your own desk." Waxman (2012). Lee (2012) BYOT. Prepared for The Australian Educational Leader Vol 1, 2012. Lee, M. & Levins, M. (2016) BYOT and the Digital Evolution of Schooling. Armidale (Australia): Douglas and Brown. Walsh (2012a) Embracing the Cell Phone in the Classroom With Text Messaging Assignments. Waxman (2012) Texting 1, 2, 3: Schools Test ‘Bring Your Own Technology’ Programs. Time. Zuniga (2012) To BYOT or not to BYOT? Sungard K-12 education blog. BYOT? Bring it on (http://byot.me) describes itself as 'An international forum for all schools seeking to make the best use of BYOT'. Set up and run by Mal Lee in Australia. Mal has been investigating BYOT for as long as anyone - and may even be the person who coined the phrase BYOT in order to distinguish it from BYOD. BYOTchat (http://www.byotchat.com) is the home of USA twitter chat using the #BYOTchat hashtag. It announces and archives regular twitter chats about BYOT/BYOD. The BYOT Network (http://http://byotnetwork.com/) is focussed on empowering students and teachers with their personal technology devices to improve opportunities for learning. The site does NOT differentiate between BYOT and BYOD. The site is run by Tim Clark, the Coordinator of Instructional Technology for Forsythe County Schools in Georgia - which is of note because Forsythe County is probably the world leader in terms of BYOD/BYOT implementation. Rolling Out BYOT is an interesting blog post relating the steps taken by a school in the USA. This page was last modified on 15 February 2016, at 11:33.